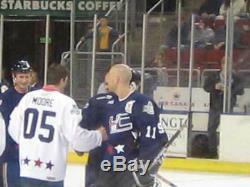 Michael Rosenbaum (Smallville) 2005 Seattle Hockey Challenge Signed Jersey - PSA/DNA. 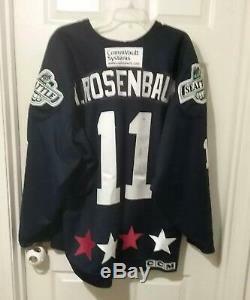 Here is a once in a lifetime type of jersey, a signed Michael Rosenbaum hockey jersey from the 2005 Seattle Hockey Challenge. 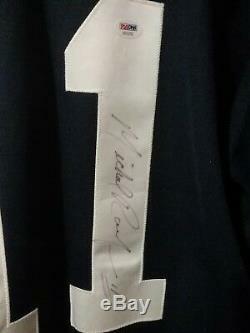 This signed jersey has been authenticated by PSA/DNA as authentic, Rosenbaum signed it on the back on one of the #1 patches, with the PSA/DNA sticker attached above. 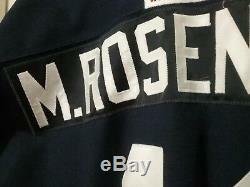 This CCM jersey is a size 56 and features all sewn patches, including the #11 worn by Rosenbaum in the event and his name on a sewn nameplate. 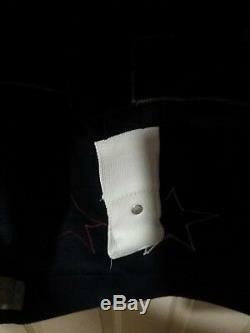 Jersey even has a fight strap. 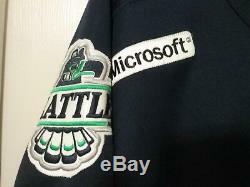 The annual event is sponsored, in part, by Microsoft and hosted by the Seattle Thunderbirds of the Western Hockey League (WHL). Rosenbaum is best known for playing Lex Luther on the WBs Smallville for seven seasons. He also starred in the movie Sorority Boys as well as the FOX show Breaking In. 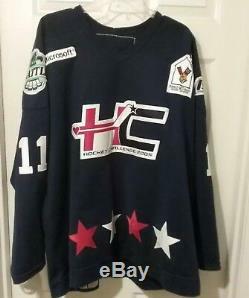 The jersey does show some signs of use but since I acquired the jersey second hand, I cannot claim that the jersey was game/event worn, only that the autograph is authentic. Though, I cant imagine that they produced too many of these jerseys (maybe just 1 per celebrity) so there is a good chance that it was worn by Rosenbaum. The celebrity games has featured such stars as Tom Arnold (who coached Rosenbaums team in 2005), Kiefer Sutherland (24), Jason Thompson (General Hospital). Dan Wilson (former Seattle Mariner catcher), Paul Guilfoyle (CSI) and Cameron Bancroft (24: Day 4, Hockeyville on CBC). And now the fine print. 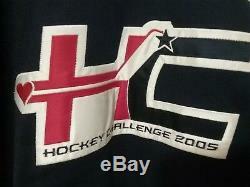 The item "Michael Rosenbaum (Smallville) 2005 Seattle Hockey Challenge Signed Jersey PSA" is in sale since Tuesday, January 30, 2018. 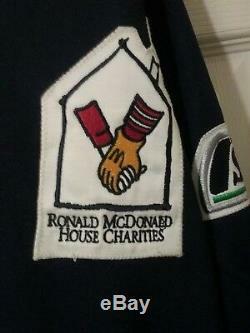 This item is in the category "Entertainment Memorabilia\Autographs-Original\Television". The seller is "nas28" and is located in Fresno, California. This item can be shipped to United States, Canada, United Kingdom, Denmark, Romania, Slovakia, Bulgaria, Czech republic, Finland, Hungary, Latvia, Lithuania, Malta, Estonia, Australia, Greece, Portugal, Cyprus, Slovenia, Japan, China, Sweden, South Korea, Indonesia, Taiwan, South africa, Thailand, Belgium, France, Hong Kong, Ireland, Netherlands, Poland, Spain, Italy, Germany, Austria, Bahamas, Israel, Mexico, New Zealand, Philippines, Singapore, Switzerland, Norway, Saudi arabia, United arab emirates, Qatar, Kuwait, Bahrain, Croatia, Malaysia, Brazil, Chile, Colombia, Costa rica, Panama, Trinidad and tobago, Guatemala, Honduras, Jamaica, Viet nam, Uruguay, Bolivia, Ecuador, Iceland, Sri lanka, Luxembourg, Peru.